FLAG Founded in July 1905 at La Spezia (transferring shortly afterwards to Genua), the Fabbrica Ligure Automobili Genova aimed to produce the most prestigious and luxurious cars in Italy. Quality was paramount, testing was severe and only the highest quality materials, including steel imported from Germany's Krupp, were used. The engines were a range of four cylinder units (16, 40 and 70bhp) whilst a six-cylinder unit was under development. 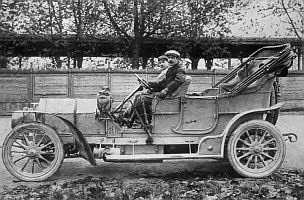 Sporting successes were also aspired to, and in 1906 they won the Circuit of Brescia with Giovanni Battista Raggio driving. Finance was not a problem, since the founders were all rich investors, but the lack of technical and organisational talent led them to close the company at the end of 1907, joining with SPA of Turin.